Detergent is an essential part of your cleaning part even if you use a pressure washer. Some of the machines already have a detergent tank attached to them. These tanks help the users to use the detergent properly and effectively. You just need to put the detergent solution into the tank and your job is done. The solution comes through a hose, gets mixed with water and is sprayed on your cleaning surface. You can buy a spare detergent tank if your machine doesn’t have one. You can also use your regular bucket to apply the soap and stay relaxed; though, you will always have to carry it around with your machine. When you apply detergent you should be sure that you are using good quality soap so that it doesn’t harm yours hand or the surface. There are plenty of detergents available in the market who will say best pressure washer soap. But you should go with the branded detergents instead of buying the cheap locally made ones. The non-brand soaps are made of harmful detergents that are not good for your skin. Buy good quality soap and protect your skin from being injured. 3.2 Can Dish Washing Soap be used in Pressure Washer? If you go deep you will find plenty of chemical differences between soap and detergent. We tried to explain the contrast of these two types in a very simple way. Soaps are made with natural ingredients and detergents are made from synthetic sources. You will find fat in soap and carbonic compounds in detergent. Soaps don’t create pollution in our rivers and lakes. Detergents are much stronger than soaps. Best pressure washer detergent is good for your delicate surfaces. Finding appropriate detergent or soap can be easy if you know about them. Once you are set with one type of detergent you will stick to it for a long time. So it is important to select your detergent carefully in the beginning. This is another product by Sunshine Markers Inc. It easily cleans your floors, walls, industrial equipment, vehicles, commercial kitchens, and many other things. Let’s know about its characteristics which will help you decide if it’s your required product. Used for pressure washing, parts washing, ultrasonic cleaning, etc. 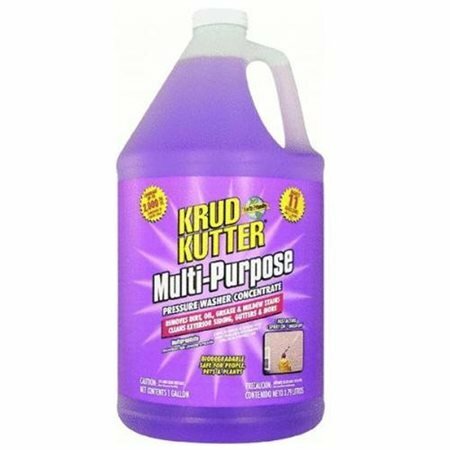 It is manufactured by Krud Kutter which is NFS certified. It removes your tough soil quickly and effectively from different surfaces. There are plenty of other things to know about this product. 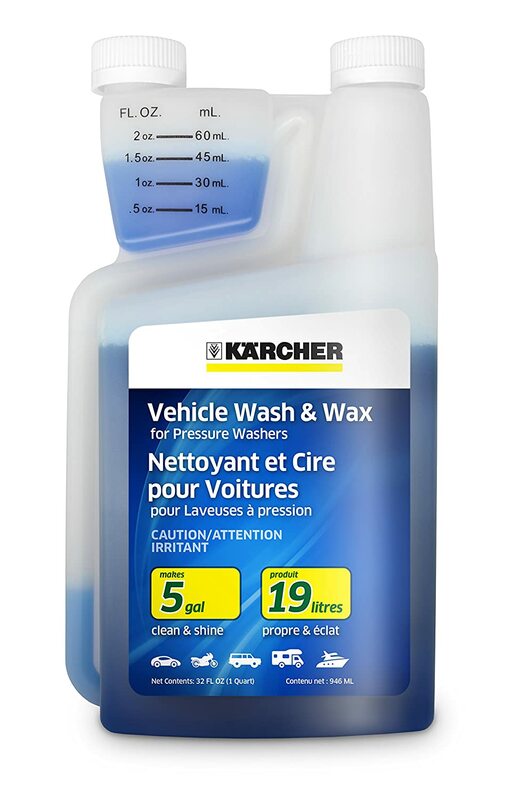 This cleaning material is made by the famous pressure washer manufacturing company Karcher. It is specially made for cleaning your vehicles. Washing with this cleaner will make your car not only clean but shiny as well. This product is easily available for the USA users. This can be your best pressure washer detergent for cars. 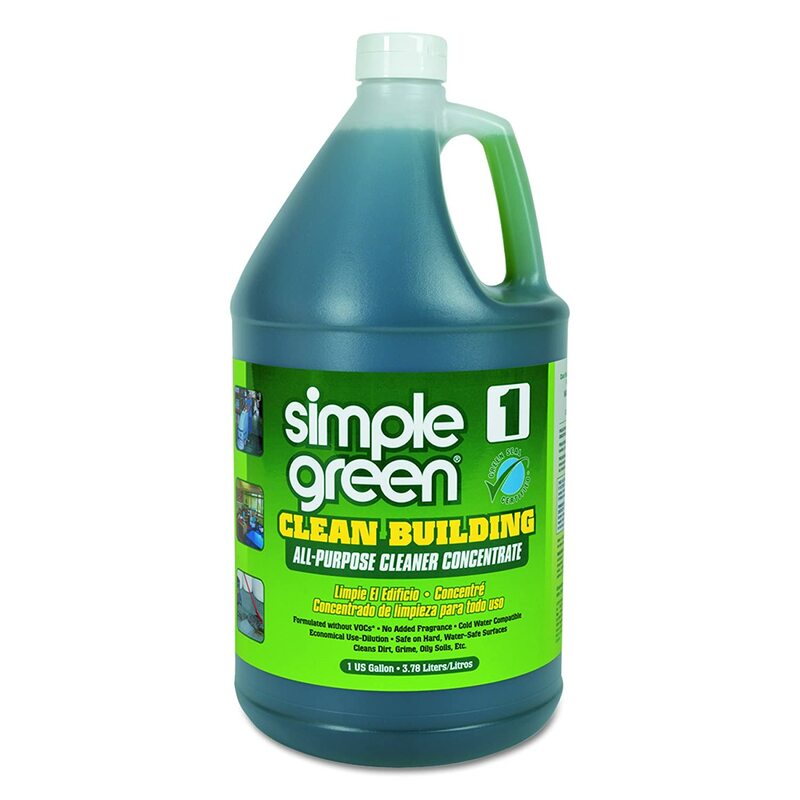 This cleaner is specially formulated to remove any kind of grease and grime from different surfaces. It will be very good for your driveway or patio. It is not harmful for plants or trees, which means it is environment-friendly. 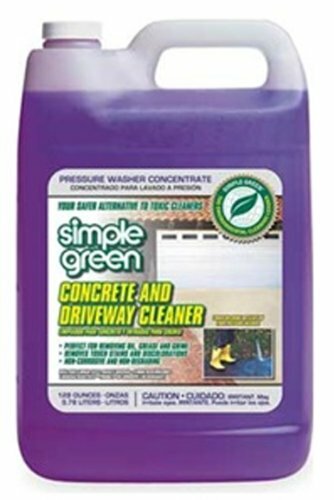 Very good for concrete surfaces such as patio, driveway, etc. Commercial strength formula is applied in this cleaner to remove the tough stain from wood, vinyl or aluminum surfaces. With this cleaning solution, you don’t have to rub the surface which reduces your work. This is easy and quick to use. You can consider this one as your best pressure washing chemicals. This is an all-purpose cleaner and degreaser. It is quite safe for washable surfaces such as sinks, tiles, carpet, floorings, etc. You can easily use it with your pressure washer. 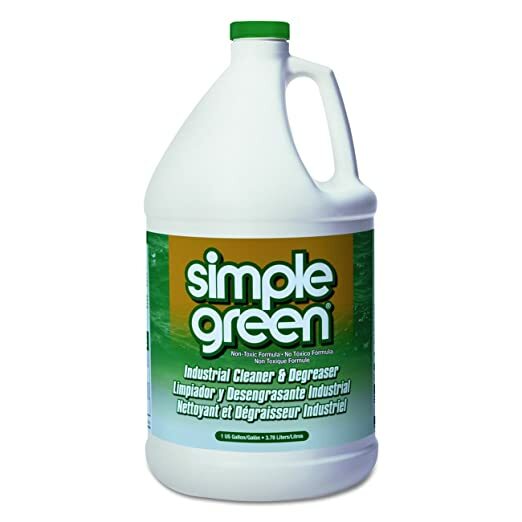 Powerful formula is used to cut through oil or grease stains. To effectively clean a wide area this product will be of great help for you. With one bottle you can cover up to 2000 sqft. area. For using at your house this cleaning solution will be very good. It has a unique additive that removes tough stains easily. You desire to find the best pressure washer soap can end with this product. Effective to clean mold, algae, fungus, moss, etc. Soap or detergent is an essential thing that helps us in our cleaning. There are things that cannot be cleaned with normal water. It is almost impossible to clean the oil stain or grease properly with just water. You have to take the help of a soap or detergent. We also need to understand the bad sides of these cleaning solutions as they are often harmful to our skin and the environment as well. At first, you need to decide what kind of cleaning solution you need. Keep in mind that soap is made from the natural ingredients such as herbal leaves or animal fat. Detergent is made from different chemicals which are not always good for health. Detergent is comparatively stronger than soap so you cannot deny its usage. Go with the good brands that are reputed in making cleaning solutions. 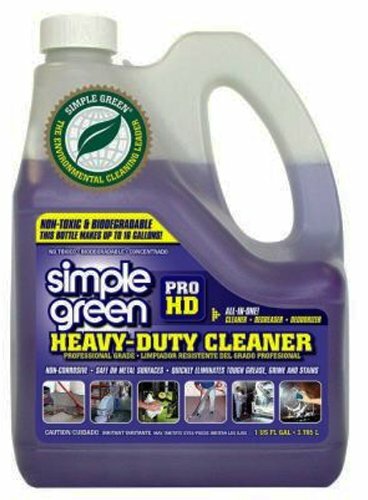 Before you buy a detergent read some pressure washer detergent reviews and knows everything about the product. Learn how to use that particular solution and on what are the surfaces you can apply on. Buy your product from good shops to maintain its authenticity. At first, I would like to say that the soap or detergent that harms our environment should always be avoided. Under certain condition, if you have to use them then you should use proper precautions to get the least harm. Try to read the chemicals that have been used to make your detergent and decide if they are safe for your skin and the environment around you. It will also help you to find out whether that particular detergent will serve your purpose. Try to use possible best pressure washer detergent. Try not to use the commercial detergents at home because they are much stronger than the normal. Different types of ingredients are used in making the cleaning solutions; some of them are chemical solutions and some of them are natural ingredients. Oxalic Acid is good for removing rust, Bleach is an aggressive sanitizer. Vinegar helps you to clean and polish the windows, doors, bronze surfaces, etc. Ammonia is used for cleaning steel and glass and Potassium Hydroxide is used to make liquid soap. Sodium Hydroxide is known as good for grease or fat remover and Sodium Hypochlorite is good stain remover and disinfectant. To clean wooden or concrete surface Citric Acid can be used. Can Dish Washing Soap be used in Pressure Washer? Dishwashing soap is considered as abrasive soap which is used to clean oil or grease. If you apply it on your car the paint might become dull or it might remove the waxing. Learn about the ingredients that are used in your dishwashing soap and decide if those are harmful for your cleaning surface. This will give you the answer whether you should use it for your pressure washer. But it is advisable that you go for proper soap or detergent when it comes for pressure washing. After analyzing a lot we get to know that it is obvious that soap or detergent is a very important stuff in cleaning work. We need to make our things look clean and shiny. Depending on what kind of things are you going to wash you need to choose your detergent. You also have to decide if you need soap or detergent. It will be wise to avoid the chemicals that are not good for you the environment. After having careful research, pick up your best pressure washer soap. There are two types of cleaning solutions, residential and commercial. Avoid using the commercial solution as they use very strong formula that needs careful application. Reading the ingredient list on the bottle helps us to know about different chemicals. If we have an idea about the chemicals we can decide which solution will be suitable for our required cleaning. The above-mentioned cleaning solutions have been carefully chosen to fulfill your purpose properly. The wide range of people uses them happily.